2 bedroom Villa UJV 191, also known as Villa Bijou, is the perfect spot for your St Barts getaway. 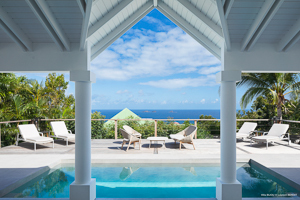 Nestled into the Flamands, St Barts, hillside, this villa has a level entry and comfortable one-floor living. As you enter from the parking area, you will find a lovely garden and covered terrace. The large master bedroom with ocean views includes a spacious two-sink vanity bath and dressing area. The master bedroom opens to its own partially-covered terrace. The generous 2nd bedroom and bath has views of the ocean and features its own terrace. The fully-equipped kitchen and wonderful "salon" open up to extensive front and back entertaining terraces, gardens, decks and the pool. With its elegant décor, artwork and antiques, the delightful all-day sun around the pool, and nights with the sound of the surf, Villa UJV 191 is sure to please the most discriminating taste. Bedrooms are are on opposite sides of the villa.